The Bonneville Lock and Dam is located near Cascade Locks in the Columbia Gorge National Scenic Area. The Bonneville Lock and Dam allows visitors to learn about and view two of the Nation's largest hydroelectric powerhouses. While touring this Dam you can also watch migrating fish travel upstream in the underwater viewing rooms. This is an excellent location for family trips, sight-seeing, student field trips and is also a great location to take some majestic photos. 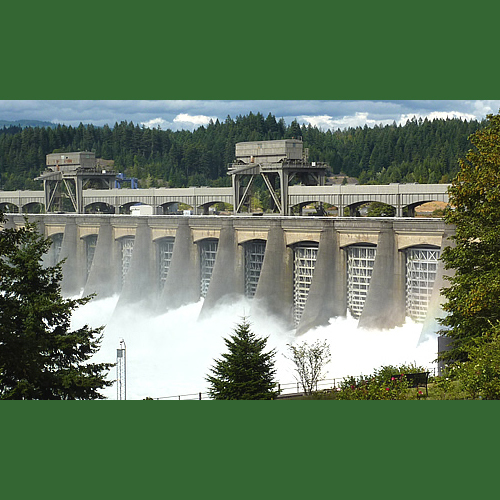 Learn more about visiting the Bonneville Lock and Dam below. The area receives a high amount of precipitation. Much of the precipitation comes from October to April in the form of rain at the low elevations and as wet heavy snow in the higher elevations. Winter temperatures are normally cool at the lower elevations and cold at the higher elevations. Although snow is possible in the lowest elevations, it is infrequent and does not stay on the ground for long. Late spring, summer and early autumn bring the best chance for clear, sunny days and bring moderate temperatures.